At the end of last week I was pulling together some internal appraisal documentation – the kind of thing where you say “oh look how many people cited my work over the past year”. Wandering over to my Google scholar profile to check some citation counts I noted something weird. Alongside my usual digital humanities-ey, digitisation-ey, digital classicist-ey journal papers and book chapters were some strange papers that I definitely had not written. Things like Human Experience and Tarot Symbolism, (link still working to my Google scholar profile at time of writing) or Tarot and Projective Hypothesis. Now, I’m a committed atheist, which means I also don’t care for the occult either. And while I try to respect other’s research choices (its a bit like feminism – I may not like what you are doing with your life, but I respect your right to choose what you do with it) this is not something that, professionally, I would choose to be associated with. And it’s extremely strange to see your name academically associated with something you don’t want to be associated with – especially when academic identity is everything in this game. Perhaps there is another Melissa M. Terras? I first thought. I’m very lucky that there aren’t too many Terrases about – I’ve never really had to deal with name disambiguation (I know academics who have other colleagues with the same name as them in the same department) so I’m a bit spoiled on that front in real life. Melissa is a really rare name in Scotland (although not other parts of the world) and so I had never met another one until I was 15. I sometimes get confused for Melody Terras, who is in Psychology, and automated algorithms especially like to assign me her works (such as Google scholar, or the algorithm in our open access repository). But no, the works clearly showed that the Melissa M. Terras was in the Department of Information Studies at UCL. There’s only one of us there, and that’s me. By now it had become clear that there was no real malice in this: but I suspected metadata fail. I had previously published a chapter in a book which was published by Sense Publishers – who published Semetsky’s book Re-Symbolization of the Self, Human Development and Tarot Hermeneutic. It seemed to me that somewhere in the ingestion process into the Springer system, that my name had gotten into the author field – field slippage in a database? that’s fairly common? S next to T in the alphabet, so perhaps field slippage in Sense Publisher’s author database? – which meant I had been erroneously associated with this work. So now to get it right. I contacted both Springer and the Press. Sense Publishers were very helpful, but ducked for cover when I hit them with the cease and desist. Springer said they would take it down. But they didnt. I complained again, and lined up the UCL lawyers to begin legal proceedings. Springer said they would take down the content (“We induced the deletion of the content from our platform, which will be done as soon as possible” – but hey, their English is better than my German, so I cant really mock them too badly when they later said they would delete the “hole” book). It took 6 days of constant emailing to complain and escalating legal threats before they eventually assigned the correct authorship information to the publication, which really must’ve been a 5 minute job. I hate to think how they would handle a request from someone not nearly as… pushy as me. I repeatedly asked for an explanation from the press and Springer – explaining a professional interest (and thinking of my dear, neglected blog, and the folks who were all pitching in on twitter by this time, following #tarotgate and the toings and froings from Springer and book author and me). I have received no explanation. You take my name, you pin it to something else, and you expect me not to want to find out why? When I work in an information studies department? No explanation has been given, and really – without malice! – I would like to know the assignation structure of author to material, given it seems so very fragile. 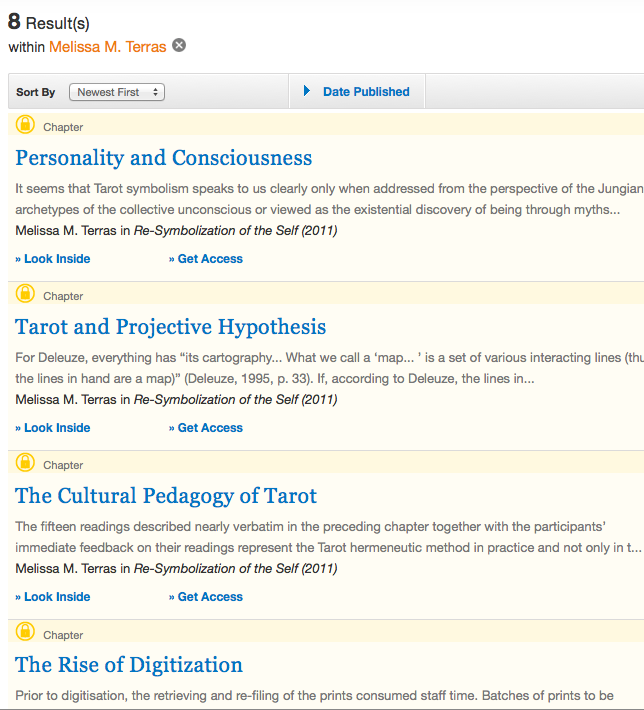 And so I am no longer associated with Tarot in publications databases. Except at time of writing, I still am. Various places crawl and syndicate authorship content online – Google Scholar is still showing me as author of various pieces of Tarot scholarship, and now its going to be up to me to chase down mentions of my name associated with something I never chose to be associated with, simply because of an automated error, replicated across time and space and electronic repository, in a professional space becoming obsessed with citation counts and authorship and If You Liked This You May Like That, all churned out by thousands of servers and databases and… who cares if a database field slips in all this and an academic name is assigned to the wrong thing? It’s the future! It’s how scholarship works these days! I have up til now pretty much ignored the discussions and systems about how to look after your scholarly identity – things like ORCID – why do I need to register! I have an unusual name! Everyone knows that it’s me who publishes on the digitisation-ey, digital humanities-ey stuff! Except the machines, the machines they dont care. We’re looking at a future where we dont just have to look after the stuff we have published, we now have to weed out the things that we havent. We have to be vigilant that the joiney-uppey automated systems dont replicate authorship errors uncontrollably. How rare of commonplace is this? I have no way to tell. But when the electronic record can be so easily compromised, how can we trust digital-only publications, without a canonical physical artefact to check? It takes a long time to build up a scholarly identity. One slipped database field may have permanently associated me with an area I, quite frankly, dont respect. This blog post will go some way to explaining how that happened, so serves a dual purpose – explanation of how, and reference for why it’s not me. When was the last time you checked what the Internet said you wrote? Will you ever be able to rectify it, should a mistake be made? Will I? I didnt see that one coming. Maybe I should take up Tarot. Update: 31/10/12, Response from the Publisher!!!!!! I will paste the email below. My colleague Georg Kaimann alerted me about the serious mistake in the author information of several chapters in Dr. Semetsky’s book. Please do accept our apologies, also on behalf of our data conversion partner, and be assured that the problem is taken seriously. High quality metadata, especially the correctness of titles, author names, and affiliations are of utmost importance for us. We have therefore taken the matter up with the production manager at our supplier. It turned out that errors in two places led to the incorrect author information which was published online: Firstly, the operator who created the xml metadata mistakenly used an already filled-out sample template for updating the chapter metadata; and secondly, quality control did not check the metadata in all chapters because they assumed that they were created in the approved way. Although this is a very rare error (I don’t remember having seen such a case before), we of course want to rule out that it can happen again. At the vendors end, the technical team will work on improving the tool for capturing metadata information to avoid errors related to manual intervention. At Springer’s end, we will investigate if further data checks can be introduced so that errors are caught early in the production process. Once again, we apologize for this mistake. Be assured that this problem is taken seriously as it affects the relationship between authors and publisher which is of high importance to us. Update: 06/05/12. Further contact from the publishers (Sense Publishers, this time, not Springer). See our conversation below. I would note at this stage that they have indeed kept their promises, the catalogue now reflects the true authorship of the pieces, and even google scholar finally no longer lists me as author of them. It doesn’t mean that this didn’t happen, though… hence the emails below. Oh, and its lovely weather here as I type this, hence my final comment. Now this matter had been solved quite a while ago, could you please delete it from your blog? I consider this matter a subject if legal action — my academic status is tarnished because of Springer — and Springer got all data from Sense. – it may have been resolved, but it still happened. My blog post will be staying up, both here and on my own personal blog. There is nothing factually incorrect, and I haven’t been nasty or untruthful. Thank God most of the people I deal with are a lot nicer. Hmmm. I’m too nice to get into a flame war with you over this. Have a good day, and enjoy the sun. Thanks for taking the time to write this up, Melissa. Fascinating as the real-time twitter telling of #tarotgate was, not all of the details made it there. It's interesting – and some sort of relief – that this is a mistake in the system rather than a deliberate attempt at passing-off. I think you, and indeed all of us, are entitled to more explanation from Springer as to how this error came about, if only so that we can judge how likely other occurrences might be. I'm disappointed, but not surprised, that they haven't been forthcoming about this. More pressure from a wider audience is warranted on this. You're right that errors of this sort are more easily replicated now, but it isn't clear to me that physical artefacts provide any more certainty. My attempts at cataloguing the books in my home have brought to light all sorts of errors in the information that publishers put on printed books, and similar errors that appear in the catalogues of institutions such as the British Library. Interconnectedness may make such errors propagate more rapidly but it can help to correct them more rapidly as well. I'm not saying you'll find it easy to deal with this one, but metadata was being messed up long before we had computers to help us do so on an industrial scale. Glad you won this one, though. Not the sort of thing that anyone can see coming! It's not the future, I've been weeding my online identity garden for a long time now and making sure all my profiles are accurate. Though I have a unique academic name when the middle initial is included there are lots of people called David Stern and D. Stern. It's even worse if you have a name like my wife Shuang Liu. The only one I can't get fixed properly is Microsoft Academic Search. I sent corrections but only some were properly incorporated. So they still have me publishing things before I was born. Maybe it was a ghost in the machine? Thank you for sharing your experience, reminding all of us to actively pay attention to our “meta-identity”. I like Kevin's note that interconnectedness may make propagate errors more rapidly but also speed up their corrections. And I'm glad you've received an (IMHO) appropriate answer from the publisher in the meantime. Still, the underlying story remains rather unsettling. Remember the fly – and the consequences! – in Terry Gilliam's BRAZIL? The thing that worries me about the latest request is the fact that your post is described as 'insulting'.